The opening and the closure of cracks because of the thermal variations of structures with concrete of cement or lean mix. Strengthen the base of the coated with a typical reinforcement glass fiber grid: Rotaflex ® 830, 838 – Cidex ® 50 SB, 100 SB, Cidex ® 150 20 SB, Cidex ® 20 100 SB. The constraints because of the movements of the crack will be transmitted in the reinforcement which has a module of elasticity very upper to that of the asphalt layer. To play completely its role of reinforcement, this grid has to have an opening of sufficient stitch so that the asphalt layer gets through. Create a plan of sliding with bitumen between the cracked part and the new asphalt layer like a sand asphalt. Rotaflex ® 816 SL has to guarantee the thickness of the bitumen. The mesh of the grid are tightened so that the aggregate does not pass through. The grid strengthens the bitumeuse membrane. The cracks can then put 5 times longer to propagate to the surface. 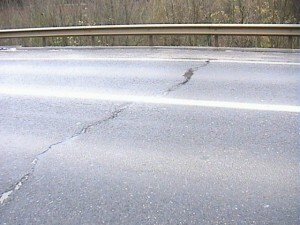 Moreover, this thin bituminous membrane in the case of the textiles improves the waterproofing of the roadway. In the test of “retrait/flexion” of the Regional Laboratory of the Bridges and Motorways of Autun Rotaflex 816 SL obtained a result upper to the sand asphalt. The cracks can put 5 times longer to propagate to the surface. Lesser embarrassment to the user: the work is made within days.